Editor’s Note: This is the first of BP Wrigleyville’s offseason player profiles. Over the next few months, we’ll review every player on the Cubs’ roster this year one-by-one and look ahead at their potential roles next year. First up: Jon Jay. 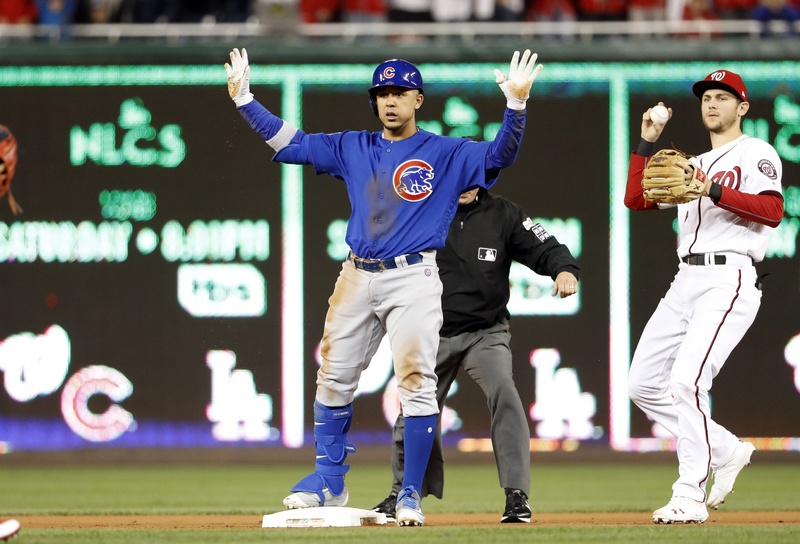 When it was announced the Cubs had signed Jon Jay to a one-year contract, I assumed that Theo Epstein was still on his post-championship bender. Jay hadn’t really been good or healthy the past two years, and he hadn’t put together an above average season since 2012. Nevermind that he was going to turn 32 this year and he had never been a good defender even in his prime. It seemed like a passive signing for a team primed to go into full dynasty mode, but Theo and Jed Hoyer must have seen something in him. 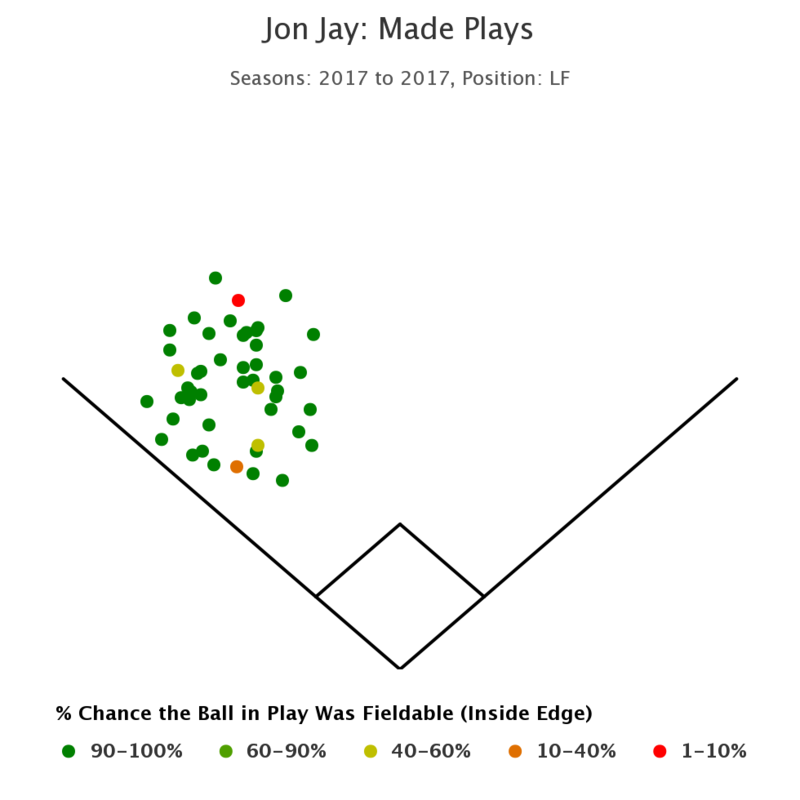 On the surface, Jay had a decent year at the plate, though his robust OBP nearly eclipsed his slugging. Jay walked only 37 times this year for a modest 8.5 percent rate. The only Cubs regulars who drew fewer walks were Addison Russell (who missed a chunk of the year), Javier Baez, and Albert Almora Jr. His OBP relied heavily on his average, which was buoyed by a .368 BABIP, the sixth-highest among batters with at least 400 plate appearances, but Jay has always had a high BABIP. His .296 average wasn’t much higher than his career mark of .288. 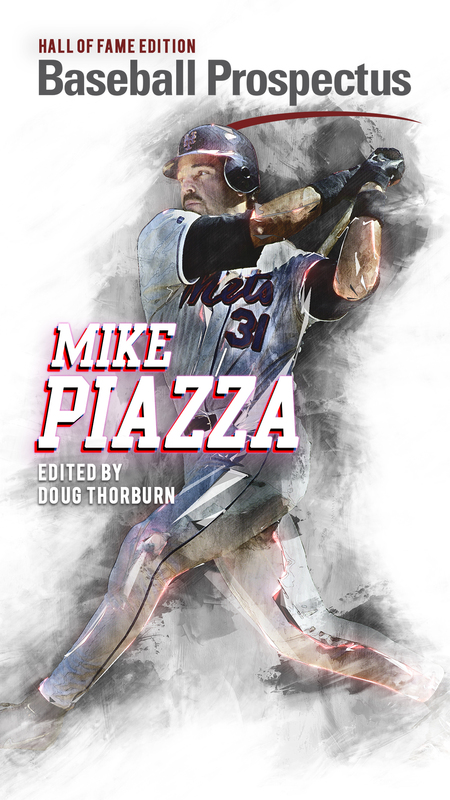 Also, his line drive rate of 31.58 percent ranked fifth among all hitters with 400 plate appearances in 2017. Considering that’s a good six percent higher than other hitters at the top of the BABIP leaderboards, it’s reasonable to think it’s not all luck. He’s actually pretty good at slapping singles around the ballpark, and his OBP won’t necessarily crater next year. That’s most of what he’s good for on the field, however. Jay hit just two homers this year, easily the lowest of any qualified Cubs position player, but that’s to be expected. He’s never been a power threat. He’s hit double-digit homers just once in his career, and that was back in 2011. Jay also doesn’t fit the profile of someone who would benefit from the bouncier ball. Jay isn’t an adopter of the fly ball revolution. 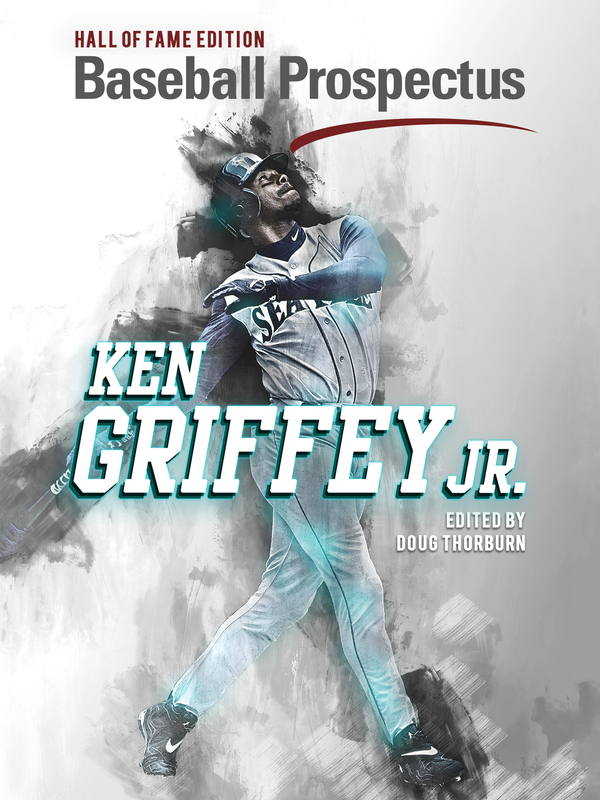 His 16.78 percent fly ball rate was the 17th lowest among batters with at least 400 plate appearances. And while Jay has usually been good for 20 doubles in full seasons, he hit just eighteen this year. What hurt his value the most was his defense. His -9.6 FRAA was the lowest mark of his career, and other metrics agree that Jay hurt more than he helped in the outfield. He was worth -4 DRS and his UZR was a measly 0.5. Baseball Savant and Statcast had him worth -3 Outs Above Average, which is the worst mark of any Cubs outfielder with the exception of Schwarber (-8). 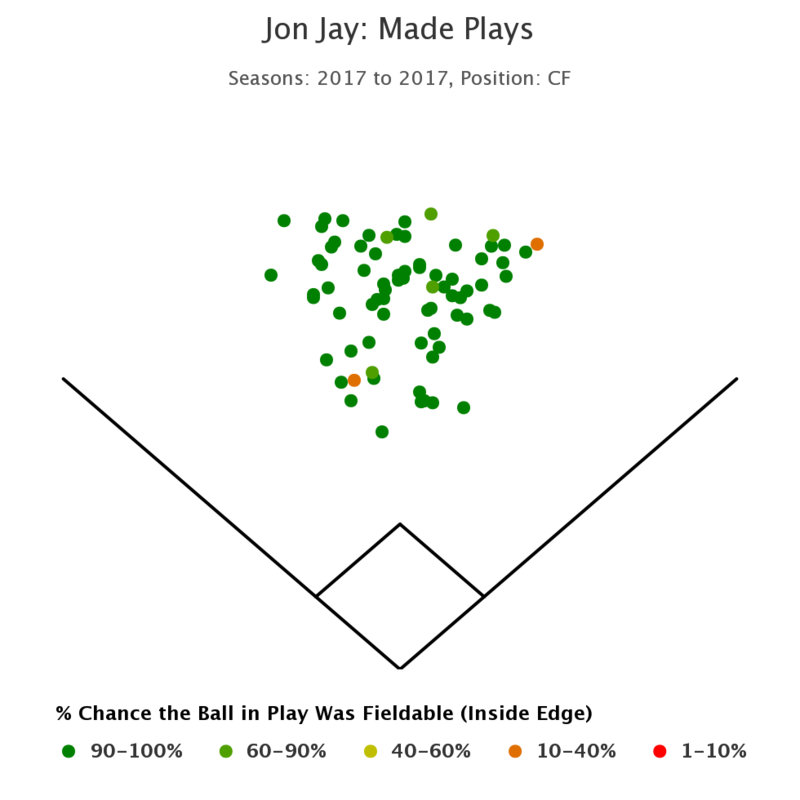 Jay fared a little better in left with tough plays, but he made only two plays of 60 percent probability or better in center. The good news is that he caught everything he should have. Most of Jay’s problems in the field stem from his ability to get to the ball. He’s still sure-handed, so if he gets to it, he’ll usually catch it. But Jay is one of only four centerfielders whose average sprint speed is lower than league average. He’ll be 33 next year, so he’ll only get slower. Jay’s days in centerfield are likely coming to a close. Because of his decreasing ability to play centerfield, it’s unlikely the Cubs will re-sign Jon Jay. Between Almora and Happ, the Cubs have two players who can play a competent centerfield, and if they pick up Leonys Martin for 2018, they’ll have a third who can play it well. If Jay has to spend most of his time in left, he’s just taking at-bats away from Kyle Schwarber, and the drop in defensive quality from Jay to Schwarber isn’t as precipitous as your eyes might tell you. Unless the Cubs trade either Schwarber or Happ, the Cubs would want to use the $8 million+ Jay would receive and put that toward starting pitching. If the Cubs make a trade, Jay might be worth re-signing since the free agent market for outfielders this year is pretty slim, but even then, the Cubs have enough flexibility where they won’t need a dedicated fifth outfielder. Jay can still help a team win in 2018, but he’s not the best fit for the Cubs going forward. These are great Kenny. Thanks much.